Forget raccoons, squirrels rule the wildlife scene in Toronto. The ubiquitous little rodents, currently in the middle of their spring breeding season, are so common that it's possible to see at least one of the critters dancing along on a telephone line or eyeing something from a tree branch almost anywhere, or so it seems. Though Toronto's squirrel population appears to be diverse, the grey, black, white, and tan creatures that populate Trinity Bellwoods and High Park are all simply Eastern Grey Squirrels, a name that is somewhat misleading and restrictive when it comes to varieties of colour. "A grey squirrel will always be a grey squirrel - it won't go through a colour change, like some animals have a winter white coat and a summer brown coat," says David Sugarman from the Ontario Science Centre, who likens the various fur colours to variations in human hair colour. "A grey squirrel is always a grey squirrel and a black squirrel is always a black squirrel, but they are the same species - it's just a colour variant." Toronto's black squirrels are an example of adaptive melanism, a natural phenomenon that sees wild animals develop high levels of melanin, a natural pigment. As a result, the squirrels have darker fur and are better camouflaged. Melanism has been observed in wolves, guinea pigs, and jaguars, to name just a few animals. 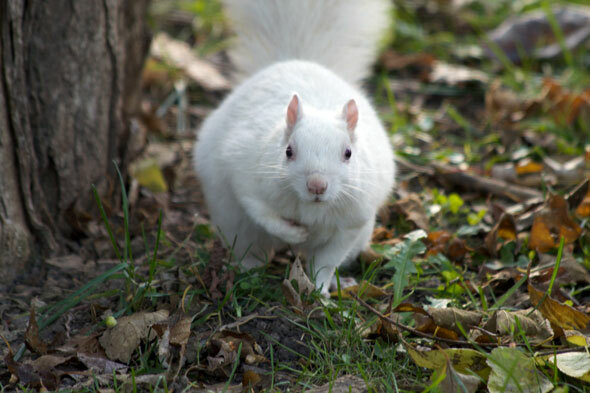 The famous white squirrels of Trinity Bellwoods Park are a product of the opposite phenomenon, a lack of melanin associated with albinism, which in hairy rodents leads to brilliant white fur and pink eyes. However, red squirrels, with their bushy ears, shorter tails, and copper-coloured fur, are a different species of squirrel, as are ground-dwelling chipmunks and groundhogs. "They are very, very territorial compared to grey squirrels," says Nathalie Karvonen, executive director of the Toronto Wildlife Centre. "You will never see a bunch of red squirrels grouped together feeding like grey squirrels ... it will usually just be one or a family group in a particular area." Though they are not as territorial as their red cousins, Eastern Greys can also get antsy when they perceive a threatening intruder, squawking and flapping their tails. The distinctive chasing, which often involves running dizzying circles around the trunk of a tree, is behaviour associated with play or mating. As for numbers, no one is quite sure just how many squirrels are roaming the city, but you can bet that it's a lot. Mary Lou Leiher, Toronto Animal Services, confirms that no one is tracking the number of squirrels in the city. "Often, when you see a high number of squirrels in one area, that could mean they have got an artificial food source." Toronto is a popular city for squirrels for the same reason raccoons like to live here: there's an a ton of grub. Studies have shown squirrels with access to a plentiful food supply have bigger litters and breed more often, up to twice a year. As a result, the city's wildlife department advises people to keep snacks to themselves. "It's an important message for the public because they are fine, they can forage and survive on their own," says Leiher. "When they are offered an artificial food source that will raise the population in that one concentrated area." The perception that there are a lot of squirrels in Toronto may be somewhat skewed by the fact the animals are active during the day, don't hibernate in winter, and are well suited to small pockets of green space. "There are so many wild animals in the city. There are some that are more visible, like squirrels, but we admit over 270 different species of wildlife here at the Toronto Wildlife Centre," says Karvonen. "You just have to be looking in the right place, and there's tons of wildlife in Toronto." Images: Oleksiy & Tetyana Kovyrin, Aaron Forster/blogTO Flickr pool.